By now, you've probably seen the video of a Yale student yelling at a professor, the Facebook post about a "white girls only" party, or the email about offensive Halloween costumes. Unfortunately, the short YouTube clips and articles I've seen don't even come close to painting an accurate picture of what's happening at Yale. I'm a senior here, and I've experienced the controversy firsthand over the past week (and years). I want to tell a more complete story and set a few facts straight. For starters: the protests are not really about Halloween costumes or a frat party. They're about a mismatch between the Yale we find in admissions brochures and the Yale we experience every day. They're about real experiences with racism on this campus that have gone unacknowledged for far too long. The university sells itself as a welcoming and inclusive place for people of all backgrounds. Unfortunately, it often isn't. 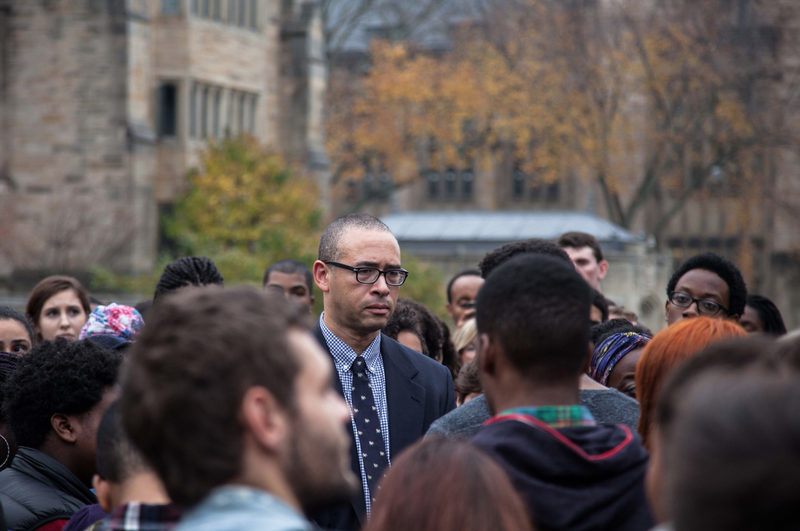 Much of the media's coverage of Yale has made it seem like students are only rallying because of an email sent by Professor Erika Christakis. (Her email suggested that culturally insensitive costumes should be allowed because they spark healthy, intellectual dialogue). However, students have had serious and legitimate concerns about race at Yale far before Christakis sent her email. They have been speaking up about the issue for years and, up to this point, have been largely ignored. Chronic racism isn't newsworthy. It quietly whittles away at the hearts and minds of people who feel like they're not being heard. On Wednesday night, I sat in the Afro-American Cultural Center with several hundred students and listened to people of color share their stories. For three hours, my friends spoke out about the racial discrimination they've experienced at Yale -- in and out of the classroom. Many people (especially women of color) said they feel physically and psychologically unsafe here. Just last weekend, several women said they were turned away from a social event at SAE because it was for "white girls only." The truth about what happened at SAE is important, but it's not what students of color are protesting about. They've encountered racial discrimination far too often and for far too long on this campus. These experiences are not imagined, nor are they trivial. Last year, there were swastikas found outside a freshman dorm. The Yale College Dean, Jonathan Holloway, sent an email to the entire student body condemning this "shameful defacement" within one day. 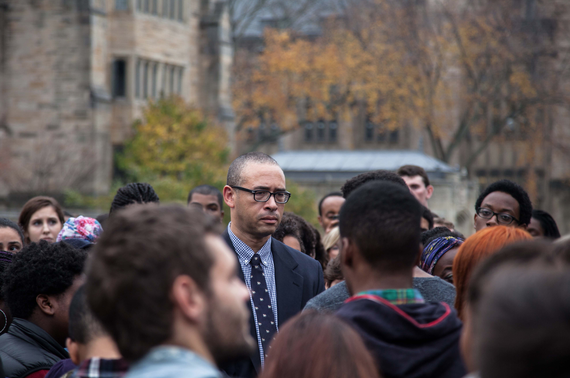 It took almost a full week for Yale's president to formally acknowledge students' legitimate concerns about racism and the incident at SAE. Here's what happened while we waited for a sign of support from the administration. Monday: Students were forced to reschedule an open forum about "cultural appropriation and the power of language" due to threats. The president remained silent. Tuesday: Holloway declined to comment on the SAE incident, but the Dean of Student Engagement began an investigation. The president remained silent. Wednesday: Students shared hours and hours worth of stories about discrimination they've experienced on this campus at the rescheduled open forum. The president remained silent. Thursday: Hundreds of students gathered in the middle of campus to chalk positive messages on the sidewalk and share their experiences with Holloway, who was eventually moved to tears. Not even one hour after this huge gathering, Yale's president sent an email to the entire student body announcing the launch of a completely unrelated initiative. He remained silent on the topic of race. At night, 50 students met with the administration in the president's office to discuss the issue of systematic racism at Yale. The president remained silent. On Friday, we finally received a letter from the administration. I write too late for too many of you, I freely admit, to make it clear that I heard every word that was spoken and I watched every tear that was shed, whether on Cross Campus or in Woodbridge Hall ... This week's conversations don't affect only some of us; they affect and include us all. As you talk to one another, listen to one another, and sometimes disagree, do this knowing that I will uphold your right to speak and be heard and that I will enforce the community standards that safeguard you as members of this community. I do this as I hold us all, including myself, accountable to give what we seek: respect. Students should not have to become community organizers just to receive acknowledgement and respect from their administrators. It's disheartening to feel like so few people in power have your back. Yes, we are angry. We are tired. We are emotionally drained. We feel like we have to yell in order to make our voices heard. While the stories in the press are about this one particular week at Yale, we've been working toward solutions for years. I've heard a lot of people dismiss this situation out of hand because Yale is a "place of privilege." But if racial discrimination of any kind can happen at a place like this, then it's certainly happening elsewhere in this country. I hope it's obvious now that Yale students are concerned about far more than just an email or a frat party. In the petty debates about these two specific incidents, people have lost sight of the larger issue: systemic racism on campus. There's absolutely no reason why we can't acknowledge both the value of free speech and the reality of the prejudice that students of color face every day. It saddens me that this has gotten to the point where people feel like they have to take sides. We should all strive for a future where, at the very least, people feel physically safe and confident in their own humanity. Let's focus on the goals we share, not the unproductive debates that divide us.